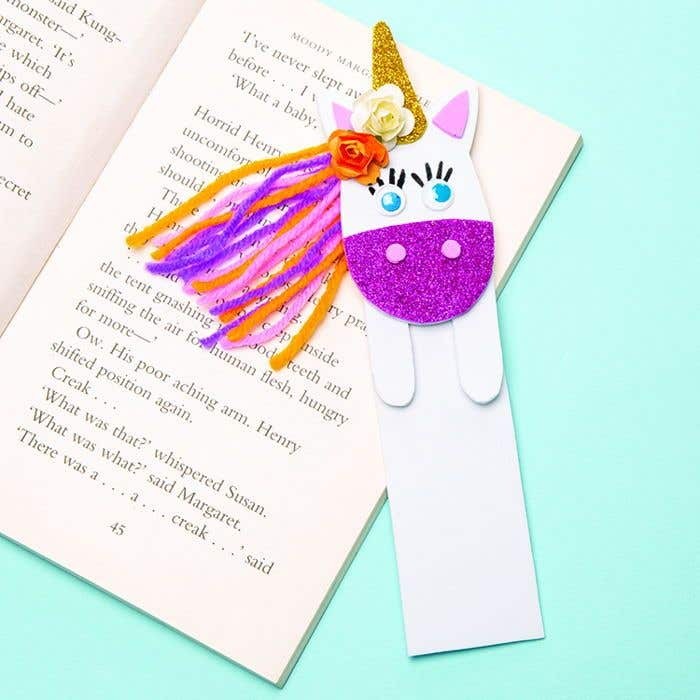 Never lose your page again with this adorable Unicorn bookmark. An extra fun addition to decorate your favourite book! Draw and cut out a rectangle from white foam that is 13cm tall and 4cm wide. Also draw and cut out two smaller rectangles that are 6cm tall and 1.5cm wide. 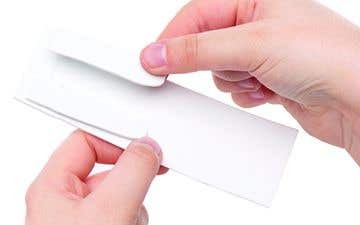 Trim one end of the smaller rectangles into a curve and glue them to either side of the top of the larger 13cm rectangle. Only glue along the top edge of the rectangles so that the bookmark can hang onto the pages. Leave the foam to dry. Draw a large oval that is slightly wider than the large rectangle from step 1, and at least 7-8cm tall. Draw two pointed ears at the top of the oval with a horn in the middle. This will be the unicorn face template. Cut out the template. On the back of gold glitter foam trace around the horn on the head template. Remove the template and draw the base of the horn a little bit past the end of the template. Cut out the foam and stick it to the template in place of the horn, making sure the tops of each horns line up with no edges overlapping. Trace around the bottom half of the unicorn’s head onto pink glitter foam. Draw a line connecting both sides of the shape on the pink glitter foam to make a long half-moon shape. Stick the pink foam onto the bottom edge of the unicorn head to make the unicorns muzzle. Like step 4, trace around the ears of the unicorn head onto pink foam. Draw another ear shape just inside of the tracing to make the insides of the ears. Also, draw two small circles that are no bigger than 70mm. Cut all of the shapes out of the pink foam. Stick the pink foam triangles just inside of the unicorn’s ears, and the small circles to the top middle of the unicorn’s glitter foam muzzle. This will make the nostrils. Using a pencil, lightly mark 2 dots roughly 2cm above the nostrils on the unicorn’s head. 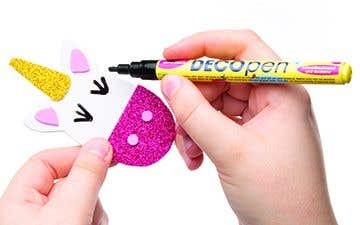 With a deco pen draw a handful of eyelashes around the dots. Wait for a minute for the deco pen to dry fully before sticking blue self-adhesive wiggle eyes on top of the pencil marks. Trim the backs of 2 paper flowers and glue them to the bottom of the unicorn’s ear for some pretty decoration. Leave the bookmark to dry fully before continuing with the next step. Cut a large handful of 10cm pieces of purple, orange and pink wool. 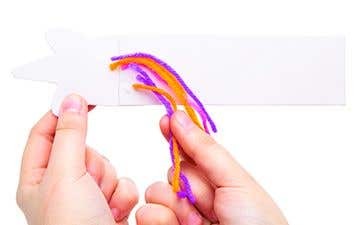 Turn the now-dry bookmark over and begin to glue the strands of wool in a slanting line along the back of the unicorn’s head. Layer the wool pieces on top of one another until a mane coming from the side of the unicorn’s head has been made. To make a rainbow unicorn bookmark use wool that is all the colours of the rainbow!